JetBlue announced a modest share repurchase program at its investor day last week. But it can afford to return more cash to its shareholders. JetBlue Airways (NASDAQ:JBLU) has dramatically improved its profitability since 2014. Meanwhile, the company has used its rising cash flow to finish rebuilding its once-dismal balance sheet. JetBlue remains on pace to end 2016 with just $1.3 billion of debt, down from $3.1 billion at the end of 2011. In light of this favorable picture, JetBlue announced plans to begin a meaningful capital return program during its investor day last week. The company plans to buy back $500 million of stock by the end of 2019. This represents a very modest share repurchase program, compared to the aggressive buybacks implemented by some airlines, led by American Airlines (NASDAQ:AAL). That said, if JetBlue continues to produce strong profits, it will probably increase its share buyback plans even further -- or start paying a dividend -- within the next year or two. In the past few years, JetBlue has bought back shares from time to time. However, in doing so, it hasn't actually been returning cash to shareholders. That's because JetBlue routinely issues shares to employees through its employee stock purchase plan. 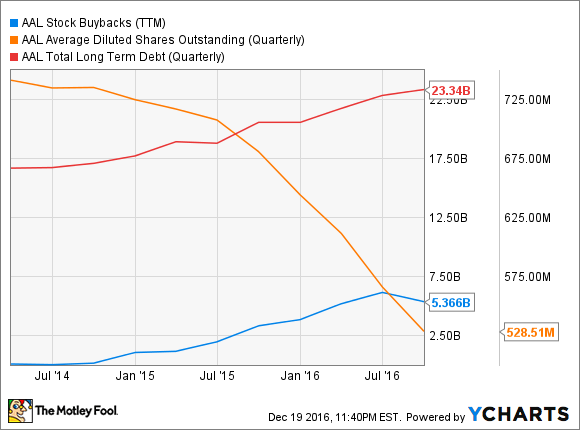 JetBlue's share buybacks have been very modest up until now. Image source: JetBlue Airways. As a result, JetBlue had 343 million diluted shares outstanding last quarter, almost exactly the same share count as it had five years ago, despite buying back stock during that period. Recently, JetBlue has been issuing about $50 million-$75 million of stock annually. It needs to spend that much on share buybacks each year just to keep its share count flat. Only share buybacks beyond $50 million-$75 million a year represent true capital returns to shareholders. Prior to last week's announcement, JetBlue had intended to repurchase $250 million of stock through the end of 2018. It began this repurchase program last month, spending $120 million through a pair of accelerated share repurchase agreements. However, $250 million is barely more than what JetBlue must spend to keep its share count flat over the course of three years. Now, JetBlue will double the size of its buyback to $500 million -- of which only $380 million remains -- while extending it by a year. Assuming that JetBlue spreads its share repurchases evenly over the next few years, its share count would decline by about 1% annually. That's better than the status quo, but it pales in comparison to the big share buyback programs enacted by the likes of American Airlines. In the past three years, American Airlines has spent a total of nearly $10 billion buying back its own stock. These aggressive buybacks have allowed American to reduce its share count by about 30% since the beginning of 2014. Most of the decrease came in the past year and a half. This has helped the company continue to post strong earnings-per-share results, despite facing margin pressure this year. The downside of this focus on share buybacks is that American Airlines' long-term debt has been rising steadily to pay for aircraft purchases. American Airlines Share Repurchases, Share Count, and Long-Term Debt: data by YCharts. Clearly, JetBlue has decided that it doesn't want to follow American Airlines down the path of using debt to fund all of its aircraft purchases in order to free up cash for share buybacks. Even so, JetBlue ought to be able to return more cash to shareholders. Last year, the company produced $1.6 billion of operating cash flow. It is on pace to generate a similar amount of cash in 2016. Meanwhile, the company plans to spend an average of $1.3 billion annually on capital expenditures from 2017 to 2020. Thus, if JetBlue can hold its operating cash flow flat at $1.6 billion, it would produce $300 million of free cash flow annually for the next four years. If the company continues growing its earnings, free cash flow should be even higher. Additionally, since JetBlue has met its leverage target, it plans to finance a portion of its future aircraft purchases with debt, rather than paying cash for all of them (as has been its custom for the past few years). This means that JetBlue should have the capacity to spend significantly more than $380 million on share buybacks over the next three years. JetBlue may have set its buyback plans based on a conservative earnings forecast. However, if it continues to produce strong earnings results, JetBlue will be able to complete its $500 million share repurchase program well ahead of schedule. That would set the stage for an increase to its capital return program in late 2017 or 2018.